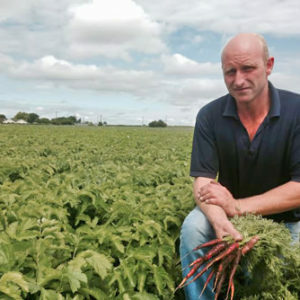 Duncan Gielty has been growing organically since 1980 at their 120 acre site, Lyncroft Farm, in Ormskirk. Their land is quite spread out and they operate a 6 year rotation, supplying Unicorn with carrots, parsnips, new potatoes, tomatoes, Swiss chard, pak choi, cucumber, spring onions, spinach and celery in the summer months and tundra and savoy cabbages, kale and leeks in the winter. As well as growing organic veg commercially, they also run a successful local box scheme. Duncan delivers the boxes himself, creating a key link between farmer and consumer.